Public schools in Bellingham, Massachusetts, hold active shooter training, complete with imitation assault weapons, rifle scopes and ammo. Using a state security grant, schools this year bought everything from high-tech cameras to emergency radios, but Bellingham Public Schools in Massachusetts bought imitation assault weapons, rifle scopes and ammo. They're using the hardware for active shooter training. It's a mock drill, but some viewers may find the video unsettling. In the days before Columbine, Bellingham Police Officer Brian Kutcher would have waited for SWAT before going into the high school alone -- but times have changed. "When an active shooter comes into a school, they want numbers. They want multiple injuries. They're not coming in, for the most part, to shoot one person. They want to out do the previous one," said School Resource Officer Leonard Gosselin. To that end, police say it's critical to eliminate the threat as fast as possible. The video above is not an actual incident. 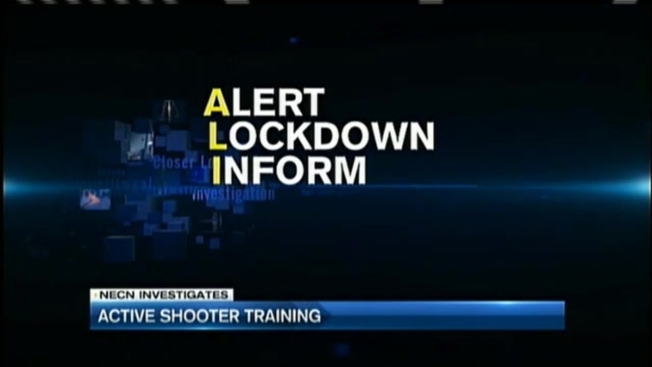 The town of Bellingham allowed us to sit in on its active shooter training earlier this month. Some say Bellingham's training is more aggressive than most. They include not only teachers, but student volunteers as well. "We're going to be dealing with kids. We're going to be dealing with teachers. It makes it as real as possible," Bellingham Police Lieutenant James Russell explained. 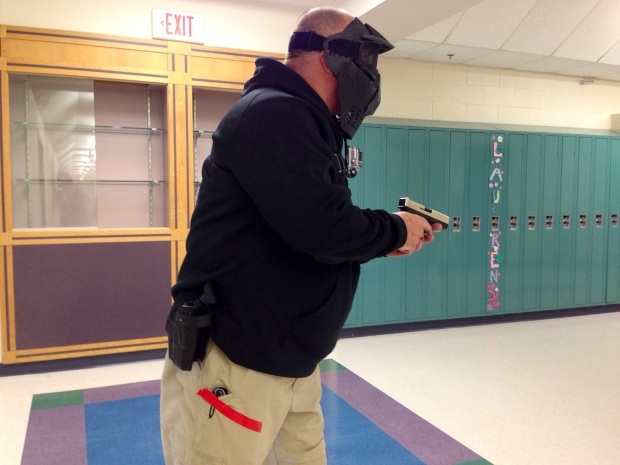 Using a state safety and security grant, the school district bought expensive Air Soft -- or imitation-- hand guns and assault rifles for police to use during school training that look and sound like the real deal. "How realistic is getting shot with a nerf gun?" asked Gosselin. "We want teachers to know when they see a gun, it's a gun." Gosselin starts the training for teachers and students with a power point presentation, mapping out a new style of training many schools have adopted. It's a variation of ALICE -- an acronym for Alert, Lockdown, Inform, Counter, Evacuate. It aims to empower students and staff beyond the old "get to a safe spot and wait" for help method. "I like to have a plan. I think this is a better plan," said history teacher Kevin McNamara. In the training, the class runs through several scenarios. In one, they sneak out of the classroom and get to safety. In another, where they gunman gets into the classroom, they use tennis balls -- what would in a real situation be books, chairs, whatever is available -- to distract him. Next, they charge the gunman -- which is actually Officer Gosselin in a hooded sweat shirt and mask -- and take him down. And another where they barricade the door, shut off the lights and stay quiet as police officers pursue the gunman. Things get serious fast. "It was like shocking," said Averi Linehan, a 17-year-old Bellingham High junior. "You didn't really know what was happening." After the training, the kids and teachers are clearly affected. "It was more realistic than I thought it would be," said 15-year-old Joseph Oliver. 16-year-old Vanessa Kutcher agreed, "It was nerve wracking." Even, their teacher, Kevin McNamara -- a marine -- was thrown. "I've heard gunfire before and it scared the heck out of me," McNamara said. A fear, the volunteers say, is worth it. We asked the kids, "What do you know right now that you didn't know yesterday?" Divina Stone, a sophomore, said, "That I could actually try to take them down with the help of my classmates and teacher." We countered, "Some people say, 'I don't want my kids to take down a guy with a gun.' What do you say?" Stone didn't miss a beat, "Well, do you want your child to die?" "We spend a lot of time teaching them to think. And they're capable of a lot more than maybe parents give them credit for. They're their kids, their babies, I get that, but they're smart kids," McNamara added. Art teacher Amanda Cabral says the kids in her classroom are safer now that she's been through the training. She said she has already rethought her classroom's layout and safety plan. "Now I'm asking, am I going to make a run for it? Am I going to hide? Am I going to barricade the door?" All options -- police hope -- they'll never have to use.